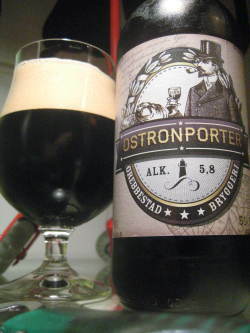 Vår Ostronporter med kornmalt, svart karamell, humle, jäst (ale) och havets diamanter från ostronbankarna i Grebbestad är framtagen i samarbete med Porter Drinkers Association. Tempereras till 16-18°C och avnjutes bäst till ostron, skaldjur eller mörk choklad. Flaske 330ml spandert av djoeye. Delt med ham og Rune i H7 19 Feb 18. Ultramørk amber. Filmskum med litt farge. Lett karamellaroma. Smaken karamell & bær. Ettersmak av karamell & salt. 500ml bottle provided and shared by djoeye. A beige head to a clear and dark ruby coloured body. Fair lacing. Modest smell of spices and mid-sweet malts. Malt-fruity flavours of marmalade, chocolate, cardamom and hints of coffee towards the ending. Medium bodied. Fair enough. (Rating session with Finn and djoeye, PivotekaH7, Tromsø 19.02.2018). Big light brown fizzy-creamy mediumlasting head. Aroma is slightly sweet mineraly, butter, minerals, weeds, grass, caramel malts, paper, bodylotion, butterscotch, bark. Taste is dry mineraly, weeds, minerals, grass, butterscotch, metal tank, paper, bark, hay, cardboard. Medium bitterness, watery and harsh mineraly mouthfeel. Meh! Smell of chocolate, licorice. Black colour, brown head. Aroma of licorice, coffee, chocolate. Sweet, mildly bitter. Lively but soft carbon. Very dark brown with light brown head. Light toasted bread in the aroma and some toffee sweetness. Medium sweet and quite bitter taste with toasty flavor. Nice tasting porter. Medium bodied with dry palate. 500ml bottle from Systembolaget. Dark ruby/brown, long lasting khaki head, some lacing. Roasted, malty aroma, chocolate, dark dried fruit and minerals. A bit sharp carbonated. Chocolate and caramel taste, chalky and roasted and a bit salty in the finish. Bottle. black with small beige head. Aroma is roasted, chocolate and some dried fruits. Taste is roasted, some chocolate, chemical and some sour coffee. Watery mouth feeling. Boring.